If you are an old school Fear Effect fan it'll be obvious the developers are too, but despite the changes this is no better than either of the PlayStation originals. Fear Effect Sedna shows that the developer truly knows its source material inside out, but unfortunately the gameplay aspect remains lost. With poor voice-acting, a broken, almost unnecessary tactical system, unreliable A.I., and flat action, Sedna just isn't fun or compelling. Despite not highlighting either its combat or stealth mechanics, Fear Effect Sedna is a pretty satisfactory resurrection of a franchise that we believed dead by its puzzles, plot and characters. Fear Effect Sedna brings back from the past the core elements of the series, with a nice story that manages to drag the player into it. A tedious slog that sullies the legacy of its vaunted predecessors. Fear Effect Sedna is a bad game. Sadly, I wanted to love it simply because of my misplaced nostalgia for the original two titles. 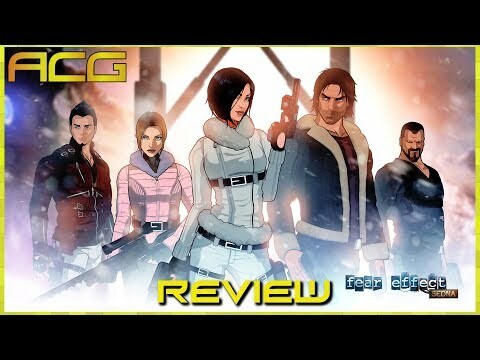 Fear Effect Sedna features nice and well-made animated cutscenes, strange and sometimes completely annoying puzzles, and barren gameplay with terrible controls, especially during boss fights. Fear Effect Sedna is sort of an interesting artifact; a game out of its own time. If only playing it was any fun. Fear Effect Sedna is one of those games that were I not reviewing it, I'd have stopped playing very early on. Its few redeeming qualities actually fail to redeem it at all; it's simply not a very good video game, one that could only be satisfactory to the most eager of Fear Effect fans. For everyone else, it's impossible to recommend. I wish the return of Fear Effect would have been something to celebrate. Unfortunately, it ends up being a mediocre attempt to revive the franchise. Fear Effect Sedna is proof creativity can't always overcome poor execution. The game is often quite enjoyable, but the inspired moments can be difficult to appreciate amidst Sedna's mishandled nostalgia, ill-considered mechanics, and sometimes-wonky level design. Those willing to ride out the rough patches (or just hungry from some early-2000s cheese) may want to give the game a try, but I'm afraid I don't see this being the Fear Effect franchise's big comeback. Fear Effect Sedna represented an opportunity to bring a well-remembered series – albeit not always for the right reasons – back to life. As is the case with many games arriving via Kickstarter, though, the ambition of the project fails to translate into the final product. Fear Effect Sedna brings a successful series back to the front line after a long absence. This new game will be welcomed immediately by those familiar with the series but new players will find it difficult to relate with the plot, as the game makes no effort to try to connect with them. The animation scenes and soundtrack demonstrate a high level of quality and good production values but the game's strategic component is less interesting than what would be expected and its visual presentation misses out when played on the Nintendo Switch handheld format. Fear Effect returns with a sequel in an indie format, which will please fans of the series even with a change as noticeable as it is the gameplay, but maintaining the signs of the saga that debuted on the PSX. It's sure that developers of Fear Effect Sedna are huge fans of the franchise. They had some ideas about this new episode and there are e few elements that feel compelling. But in the end, there are too many things that just don't work or frustrate the players. Too bad. Fear Effect Sedna conclusively stomps out any life the series had left with its shallow, malformed gameplay and disjointed narrative. Fear Effect: Sedna is a flawed amalgam of disparate parts. It fails to wholly convince as an action, strategy or stealth game, and the delivery of its story is a little stilted. However, the sheer variety of its mix and its fresh visual style may prove enough to keep you playing through.